When you first meet Janelle, you’ll find her sincere, accepting, and so down-to-earth that it seems like you’re already friends! 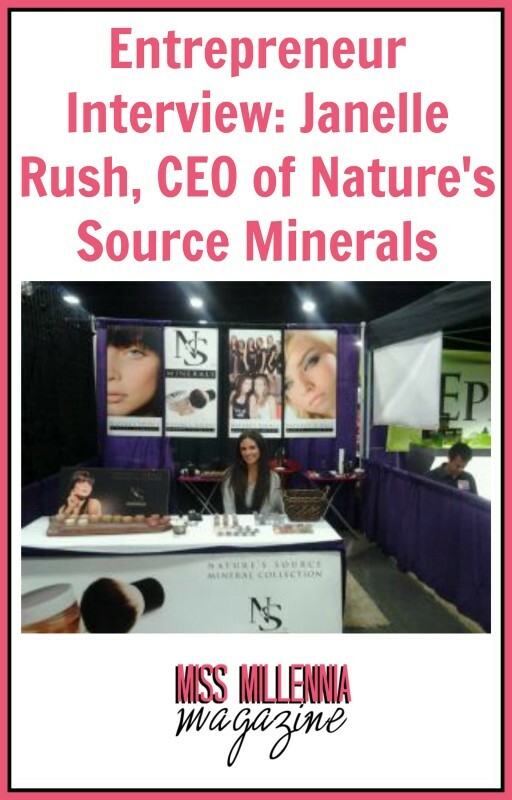 At 27 years old, she’s the CEO of her own make-up company, Nature’s Source Minerals. She’s definitely not afraid of hard work, staffing her own tradeshow booth and mall kiosk, selling and doing make-overs, on top of scoring promotional TV spots and publicity for her company, making video blogs for the website and managing the business. How does she do it? At the height of NS Minerals success, Janelle had up to six kiosks in malls throughout the Salt Lake and Utah valleys, today she’s closed her last one. Even if it isn’t always living the dream, she is still focused, staying determined and working smart to make her business a success. This is what Miss Millennia represents, a go-getter girl that never gives up and never stops growing and improving to be the best she can be. We caught up with Janelle to ask her about her experience creating and running her own business. Not only does she have an incredible product, she has an proactive attitude and a commitment to making it happen day after day. Where did the inspiration for NS Minerals come from? I worked selling mineral make up when I was 18. It wasn’t very well known then and I was even skeptical about how a powder can be an effective foundation. As I studied the effects of different things we put our skin, liquid makeup seemed to go against everything I learned in school of health for your skin. I saw that there weren’t truly beneficial options out there and that women were wanting natural, healthier makeup, they just didn’t like the ones they had tried. I wanted to develop the most superior make up out there. The fact we don’t compromise the integrity of the product for higher markups has always helped customers stay loyal. What makes you an expert in make-up? I went to school and passed for an international certification in Esthetics (CIDESCO, it’s recognized in over 120 countries). I studied various aspects of skin anatomy and cosmetic chemistry there. But most of my knowledge came from self-teaching. I’ve studied ingredients and began to experiment with raw materials. I did most of my learning through a lot of re-investing in research and development. If you aren’t currently in college, what alternative did you take to put yourself on the road to accomplishing your dreams? I’m not currently in school and haven’t been in school since studying esthetics. But I am considering starting school to study business next semester. It’s hard to have the time for schooling when you work a lot of hours trying to build up your business. I have done professional development seminars and workshops. I’ve also used the Small Business Resource Center (which is a state and federally funded program done through colleges, that is a FREE resource many people don’t know about!). It’s been great for getting unbiased guidance and resources. You need all the support you can get when going after your dreams. http://www.utahsbdc.org/. I’ve also frequently attended events where I get to learn from many successful people in their trades (finances, licensing, legal, etc.). I learn best from picking the minds of people who have done it before me. I read books about business, and just look up everything I don’t understand. I also like reading autobiographies of successful people which helps me learn from others successes and failures. Knowing their struggles and processes to obtain great achievements help keep me motivated. Well I could give you a list here… Every business has ‘growing pains,” taking these pains and turning them into something positive and learning from them is a struggle, a struggle that if not handled correctly could easily kill a business. Also, learning due diligence and discernment. I am a naturally trusting person and being young and inexperienced has attracted a lot people with bad intentions. In business there are a lot of time wasters, manipulators and thieves. We’ve had a lot of money, product and even ideas stolen from us. Every instance was different and carried their own weight of consequences… Mostly just having to get back up every time we were knocked down or lied to. At times after years of work we had to practically start from scratch while struggling financially. Luckily I have a great business partner, and together we have had our ups and downs. But after seven years I know he is trustworthy and has the same goals of keeping the integrity in the cosmetics and the business. Ultimately we just want to help as many people as we can one day at a time. That’s hard to find in a business partner so I am grateful for that. Being your own boss. To not have to answer to anyone and create your own livelihood. Being uncomfortable for years so one day you can be more than comfortable and help others achieve the same. It helps you to stay focused on what works. You make your own schedule and take your own risks. The constant uncertainty. It’s definitely not for the faint of heart. You have to constantly take financial and time risks. Some things pay off and others can dramatically set you back. You likely will make big and little mistakes that can sometimes be humiliating or devastating. But it’s about getting back up again no matter how hard the hit. There are many times I’ve wanted to give up, it was so hard, but I’m proud I’ve kept going. Often you’ll think you’ve already learned a lesson, but the prospect of your dreams coming true over night will excite you, and then disappoint you. Nothing happens over night. Usually those things that seem too good to be true, are. Not to sound negative, it’s just a matter of having your expectations and daily goals in the right place. Every great success was several years in the making. It’s the tenacious ones that see the triumph of great achievement. Don’t try to do everything yourself and don’t wait until everything is perfect to take action. It’s the two mistakes I’ve done plenty of times and tend to see women fall into. We tend to want to take on every role and are often afraid to ask for help. You will not perfectly understand everything about business right away, or ever. Focus on the traits you’re excellent at, and delegate the rest. It is so significant to running your business properly. You don’t have to have everything be a masterpiece to make it happen. I turned down a lot of business and prospects because I thought I wasn’t ready and those may have been huge mistakes. Just take action. You’ll lose those leads if you don’t try, it’s ok to make mistakes, you’ll learn the most from your mistakes. Other entrepreneurs and myself have been great supports to one another. Be part of groups of other women business owners. You can help keep each other motivated and interconnect your networks. Business is all about sales and strategic partnerships. Be happy in your ups and downs. Success isn’t an end goal. Just going after your passion is success in itself. I’ve always had a particular passion for the blessing of our free market system, and the opportunity to mold and create something and do good in the world. I love building up women’s confidence. I think we live in a society where women are far to self-critical and critical of each other. We are constantly putting positivity in our marketing and messages we put out to the women that inspire us. Most marketing and media constantly feed us images that degrade self-esteem and promote things that aren’t even real. We want to be different than other cosmetic companies out there. (We don’t airbrush our photos, things like that). We’re about health and enhancement, protecting and promoting the skin and being fun and artistic in the process. We strive to serve all those that use our products and it’s the people believe so passionately in our products and what we’re doing who inspire us the most. Thank you so much Janelle! Your experience and perspective is really inspiring and we wish you the best success with NS Minerals! A little bit about the makeup: Not all mineral makeup is created equal! NS Minerals uses the highest quality of mineral pigments which makes it a great product for hot and humid climates, and all skin types. The foundation goes on very light and soft. Find out more here. Even her brushes are animal free. I found her booth at a tradeshow and was stunned at the versatility of these products. Take one pigment, use it dry: eyeshadow, use it wet: eye liner, mix it with clear lip gloss for a new lip gloss color or mix it with clear nail polish and paint your nails with it! That’s four products in one color! This make-up comes highly recommended. Check it out! Use it for your everyday look or get dramatic. Janelle has generously provided a special promotion for our Miss Millennia Magazine readers! 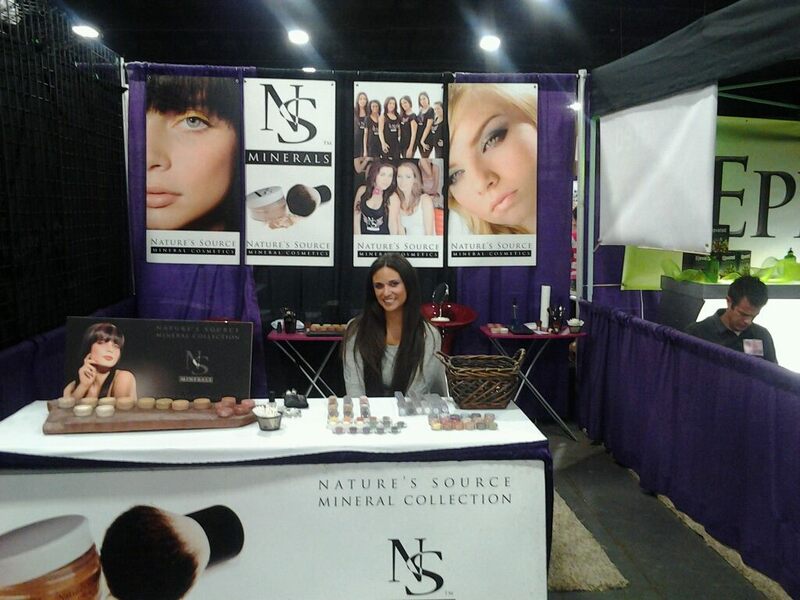 Order NS Minerals online and use the promo code: missmillennia to receive 15% off your purchase!